Going and coming to Kalapana, you must pass through (or right beside, depending on the exact road) Pahoa. 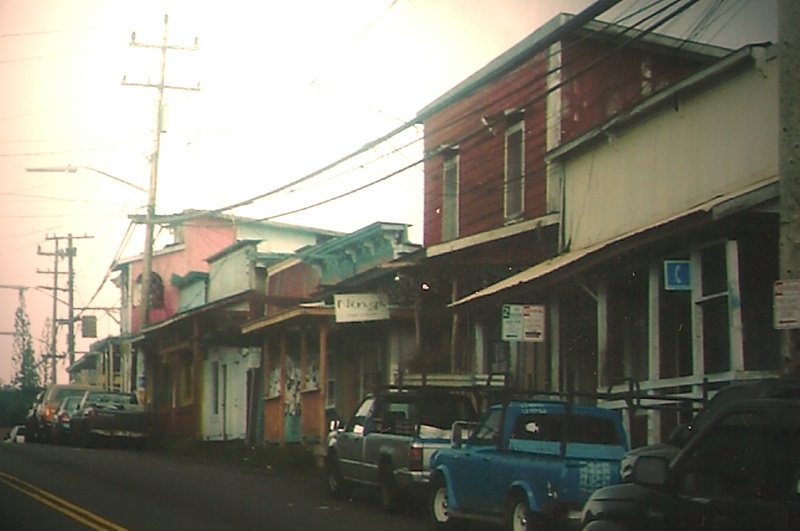 When I was telling Amanda about Pahoa, I mentioned: 1) the best Mexican food on the island (Luquin’s), 2) the first time we were there, there was a brawl in the street of Old Pahoa, like “old West” style, with, it turns out, fireworks going off, but it sounded like gun-shots, and 3) there’s a guy who rides around on his bicycle, with a chicken on his shoulder. There’s a lot more to Pahoa than that, but those are my highlights. 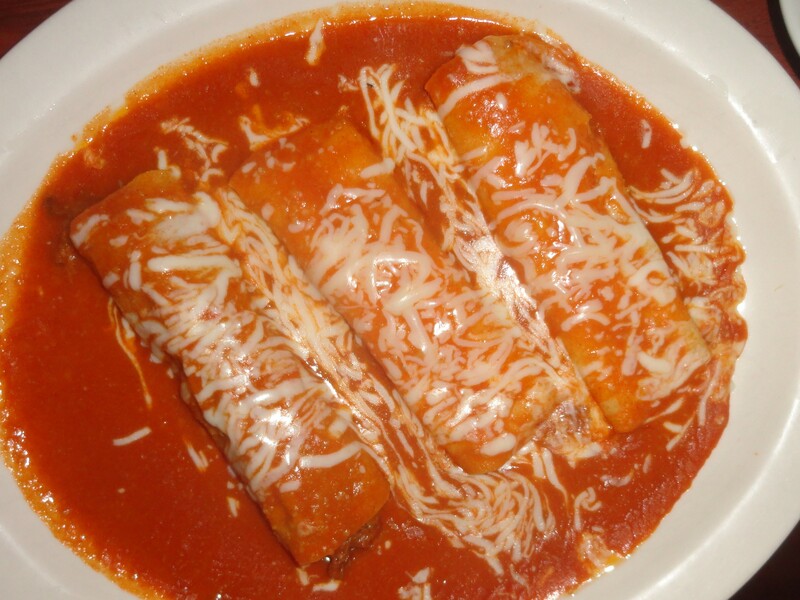 Luquin’s ~ If you have read my blog off and on from the beginning, you will know that Mexican food is an ongoing theme – a constant under-current. I love Mexican food. I mean ~ I’m not adventurous at all. I order the same exact thing wherever I go: a cheese enchilada, a beef enchilada, and soft shell (if available) beef taco. I do switch it up with the sauce ~ choosing randomly (so as to throw chaos into the situation) between tomato, mole and verde sauces. Peter switches things around, but always gets chili relleno (at every Mexican restaurant). And, always, a margarita – house specialty, blended, if possible. 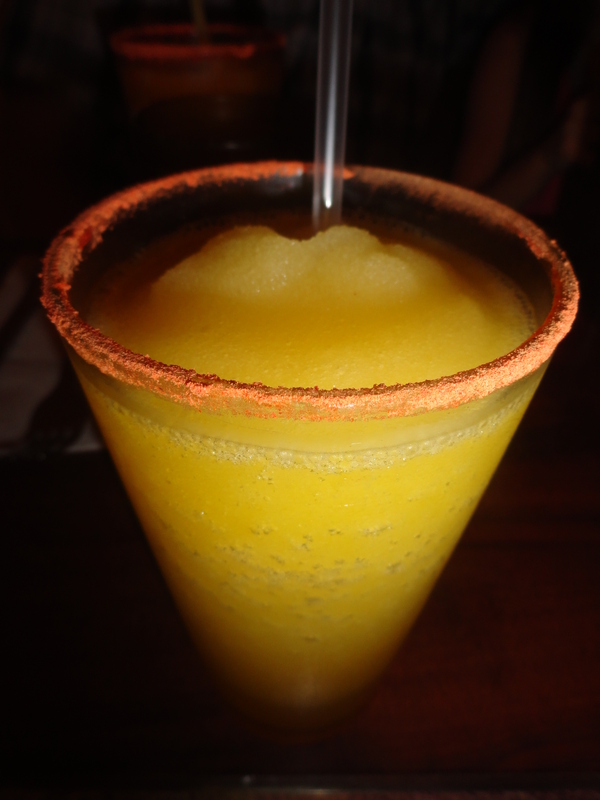 At Luquins, my favorite FAVORITE is lilikoi (passion fruit) mango combo, blended, with a Li hing mui rim. Wikipedia says “Many bars in Hawaii also rim their glasses with li hing powder in addition to putting it in the drink.” I wonder why it’s specific to Hawaii… SERIOUSLY! if you try it, you will LOVE IT! Love love love it. 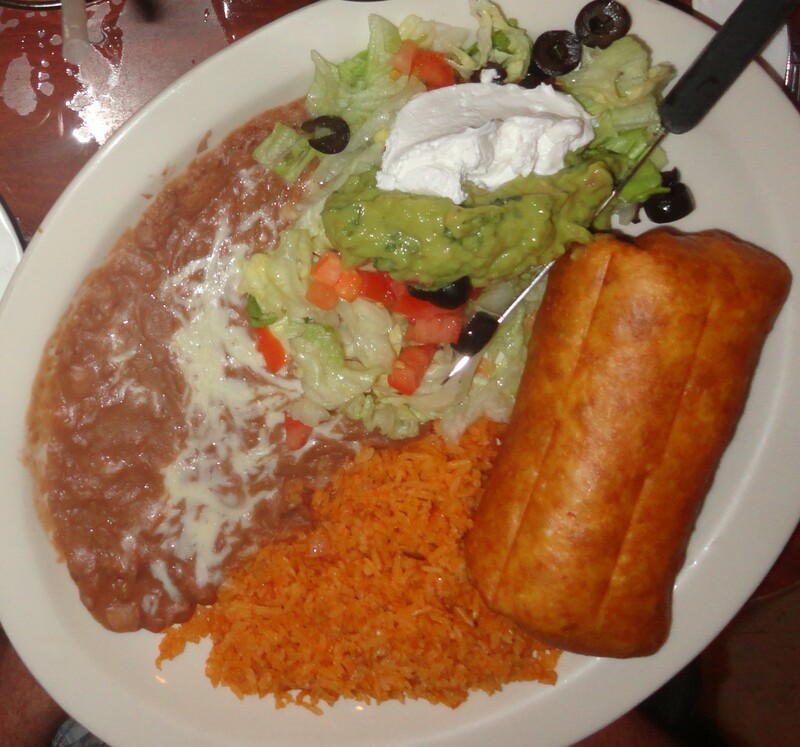 Luquin’s always is exactly what we hope for! We are never disappointed. Somewhere in Pahoa is the Black Rock Cafe, which is half bar (not even a pub, but more saloon-y), and half restaurant. On the restaurant side (and maybe also the bar-side…?) has really good fish and chips, and I’ve never been disappointed with any of their food either. 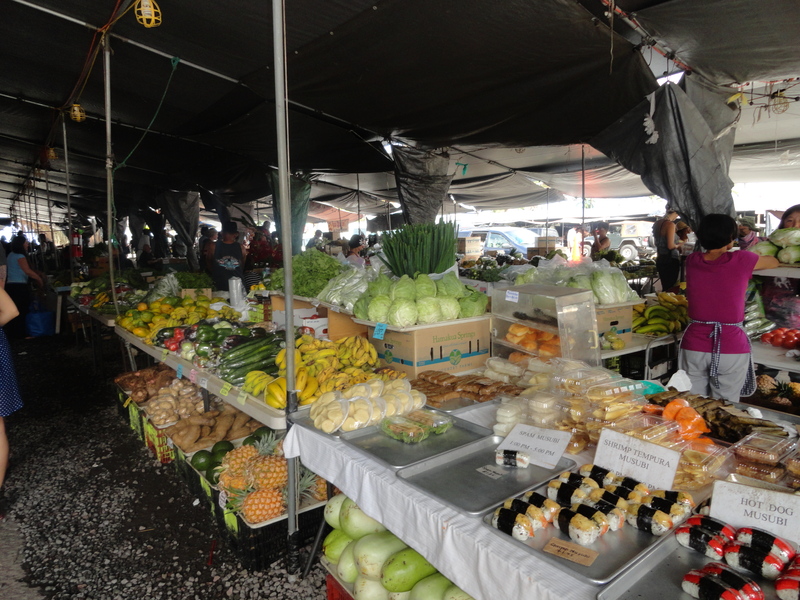 Kea’au also has a Farmer’s Market – it’s very small, but is open every day, for your convenient fresh vegetable and fruit shopping. 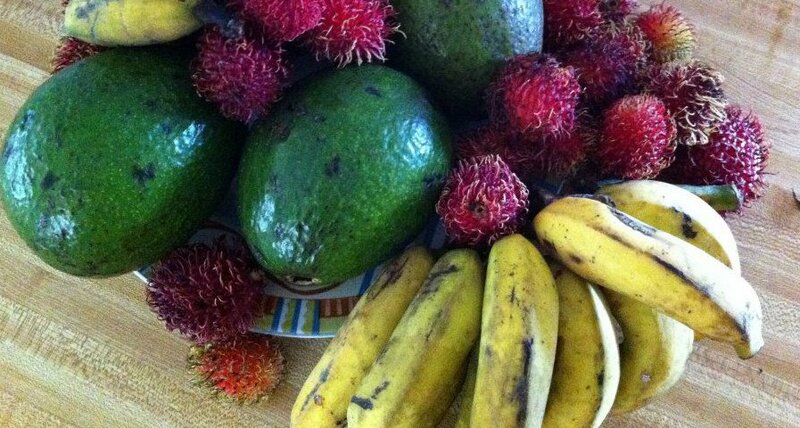 I bought avocados, a bag full of rambutan (which I bought because I’d never seen such a thing and the vendor gave me an entire bag for $1), and a bunch of apple bananas for about $5. There’s a nice little grocery store there – Foodland. The prices are pretty good, and if you have a Maika’i card, you can often save about 1/4-1/3 the cost on most items. There’s also a health food store there, called Kea’au Natural Foods, which has a lot of everything packed into a very small space. Kea’au is on the main road going from Hilo to Volcano, and is at the turn-off to go to Pahoa. It’s a larger town than Pahoa and has more options for shopping, etc., but isn’t near as quirky. 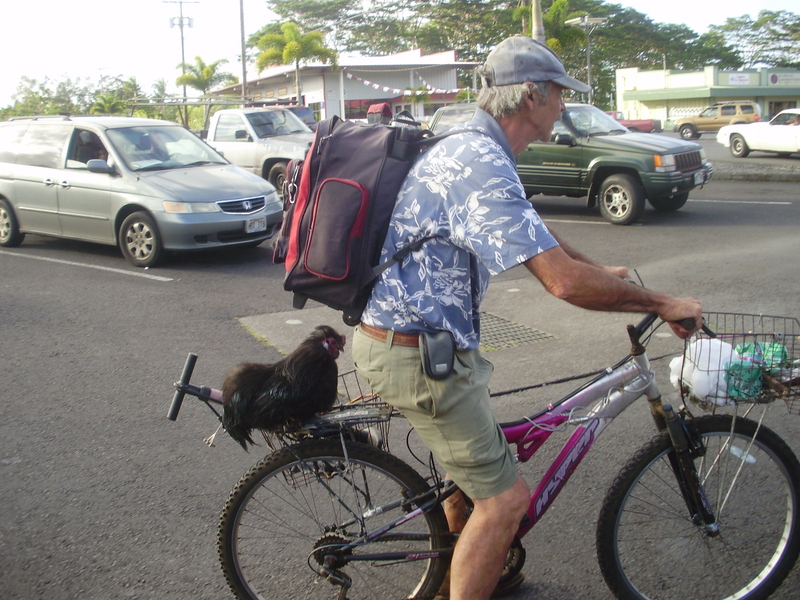 The first time we were in Pahoa, this man rode by on his bicycle with a chicken on his shoulder. This time, I told everyone to “keep their eye out” for the “chicken guy”, but really didn’t expect to see him. The next thing you know, in the parking lot of Malama Market, there goes the chicken guy! The chicken was riding on the back of the bike this time. Sunday, I think we’ll talk about Punalu’u, South Point and the Green Sand Beach.